If you've ever enjoyed a double double, worn a bunny hug, or paid with a loonie - you're in the right place. Get familiar with what Canada has to offer. 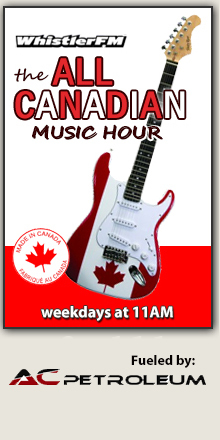 Tune in to the All Canadian Music Hour, weekdays at 11AM. A full hour, of Canadian music pulled from the smallest of towns, near and far, coast to coast, with a little added flavor from our local musicians including Mike and Garnet of Animal Nation, Susan Holden, Chad Oliver and Ian Cameron of Ruckus Deluxe, Jon Shrier, Greg and Doug of the Hairfarmers and Sean Rose to name a few. Tune in to the Whistler FM ALL Canadian Music Hour, weekdays at 11AM. Eh!!! Presented by AC Petroleum at Nesters Crossing. Save at least 3 cents per litre every day AND open to commercial and non-commercial customers, 24 hours a day, 7 days a week. Locally Owned and Operated. AC Petroleum at Nesters Crossing.